It’s no secret that I will choose outdoor running over the treadmill no matter the weather conditions. I’ve run in blizzards, wind and rain storms, and temperatures in the negative digits. I’ve come home with a nice layer of sweaty ice covering much of my body, and plenty of chilly but survivable digits. At the heart of my survival is a solid winter running coat or outer layer. For the past few years, I’ve put an old race-earned running jacket to good use and it has served me well as one of many layers. 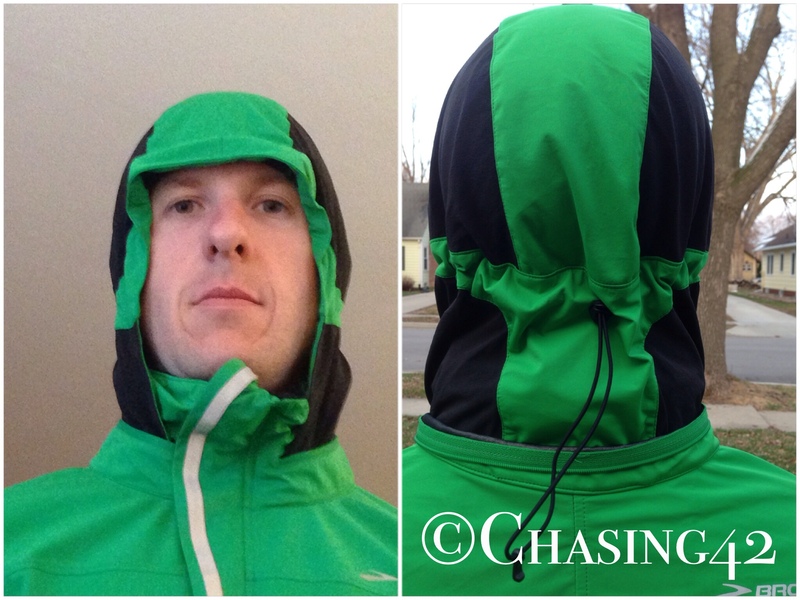 However, the zipper finally broke and I found myself in need of a new cold-weather running jacket. Running in the unpredictable Iowa winter has given me plenty of food for thought as I searched for the ideal jacket to meet my year-round outdoor needs. Not only did I need something relatively lightweight, but also windproof and water-resistant. Ideally, I would also find a jacket I could utilize into the mid-30s as well, until I made the quick transition to long sleeves and shorts 🙂 I ended up doing far more research and reading than was probably necessary, but I’m nothing if not thorough. This overabundance of research left me with a good sense of my options. 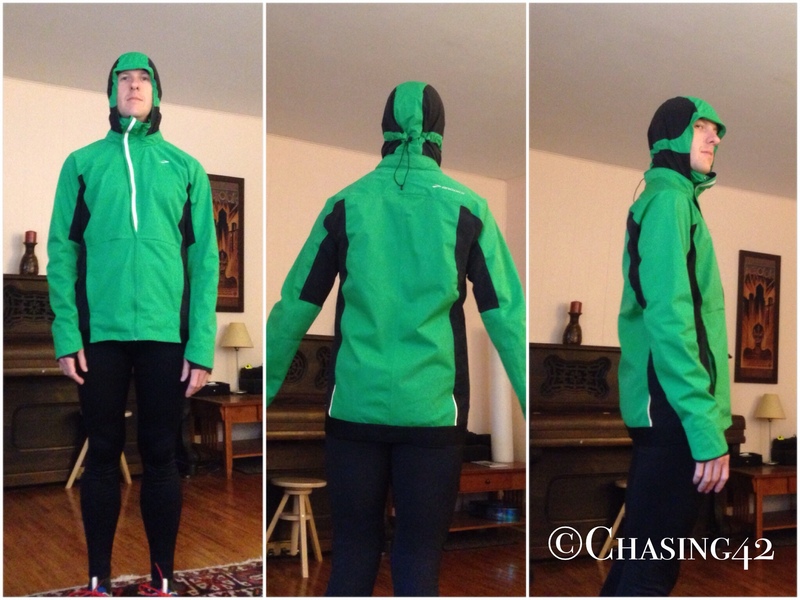 Ultimately, I opted for a running-specific jacket as opposed to a more general use soft-shell with good running cred. I pulled the trigger on the Brooks Silver Bullet II jacket, and I couldn’t be more happy with my choice! Fit & Appearance: The jacket has a semi-fitted structure. It’s by no means baggy, and hugs my body quite well, while also being loose-fitting enough to accommodate a variety of layers underneath. It sits below the hips, and has a nice elastic strip at the bottom to keep it from riding up while running. This update to the original Silver Bullet jacket includes an articulated hood that stows in the collar for quick deployment via a zippered-pocket. It cinches easily in the back, has a small brim, and offers a nice snug, athletic fit that stays put, even in 30 mph headwinds! This is not a cheap after-thought hood. The added detail of a fabric overlay at the top of the zipper is a nice touch for added comfort, and the collar comes up high enough for nice neck protection and has a soft feel for comfort. 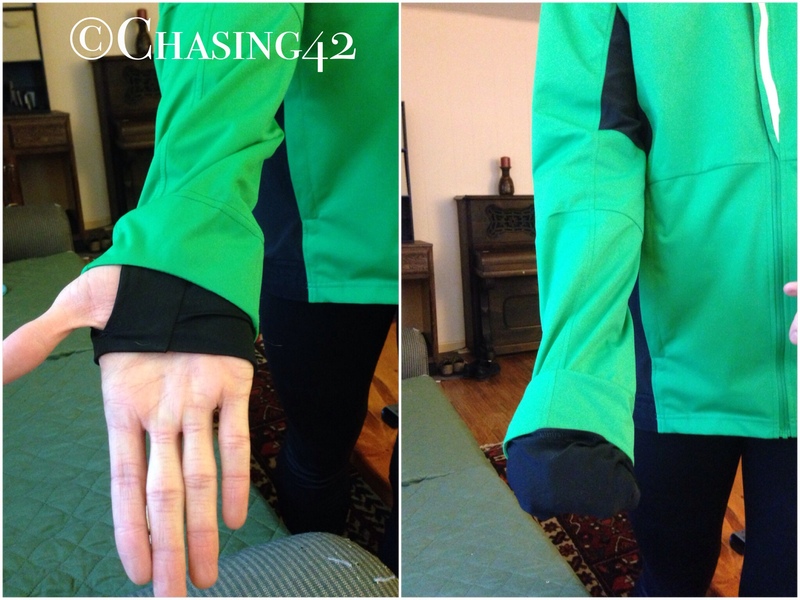 The jacket also has extended thumb holes for added coverage on your hands, and added “flip-mits” that work as emergency mittens. These are more of a gimmick than an effective addition to the jacket, but I applaud Brooks for trying something new. The arms extend a bit longer on top of the hands as well, which is a small, but nice detail. I decided on the Kelly green color, with black accents, and plenty of reflective stripping. Although this wasn’t my first color choice, I’m not really happy with the choice. It’s bright enough to add some additional visibility without being obnoxious. Although it’s a running-specific jacket, I’d definitely grab it for a more active hike or colder outdoor ride. For those of you that like to carry your phone or other media player with you, a water-proof internal pocket is nicely positioned lower on the abdomen to prevent jiggling. This serves as a nice secondary pocket, complimenting the two side pockets, for nutrition storage as well. The medium fits my 5’11” 165 lb. frame extremely well, to the point that it could have been tailored for me. Breathability: I sweat A LOT, so I’m always concerned with the breathability of running apparel. Various products that claim to be breathable have left me drenched in the past. However, the lightweight material (nylon and polyester) breathes very well, while retaining heat (more on that to come). The inside of the jacket was almost completely dry, even after 30 miles in single digit temps. Warmth: This is where the jacket really shines…or should I say reflects! The internal aluminum membrane reflects your body heat back towards you “for powered warmth without the weight”. It looks really cool, but sounded a bit gimmicky when I bought it. However, after running in it for a few months, I’m sold. This jacket claims to be built for 40 degrees and below, and it absolutely fits that bill. I was quite comfortable in nothing more than a short-sleeve tech shirt at 20 degrees, and a long-sleeve tech shirt in 10 degree weather. Below 10 degrees, I busted out a heavier Under Armor heat gear shirt, and it kept me toasty warm, even when the wind chill dipped below -20! The lightweight nature of this jacket would have left me skeptical, but the proof was in the pudding. This jacket does the job. All-Weather Protection: The Silver Bullet is billed as windproof and water-resistant. The harsh Iowa winds have given me plenty of opportunities to test the windproof-ness of the jacket, and it has held up quite well. The semi-fitted nature of the jacket also means the wind isn’t sneaking in and creating the parachute effect we are all familiar with in other jackets. As with many products that claim to be water-resistant, this was true to a point with the Silver Bullet. It definitely beads up water and will keep you try during short showers, or a light rain. However, harder rains/snows or more driving rains/snows will accelerate the saturation of the jacket. In those heavier precipitation moments, I averaged about 30 minutes before the moisture started to soak through. However, the jacket kept me toasty warm even once the moisture began to seep in. This is always the trade-off when you go with water-resistant vs. water-proof. The increased breathability makes this a more than acceptable trade-off for my running needs. Overall, I’m extremely happy with the Silver Bullet II running jacket. Brooks has produced a well-designed, and versatile running jacket for folks who don’t retire to the treadmill when the temps dip below freezing. I may be recommending this to a few friends to increase my winter running company!